The diaphragm valve uses a unique rigid diaphragm design to act as a front closing valve to accurately dispense small dots and fine beads. 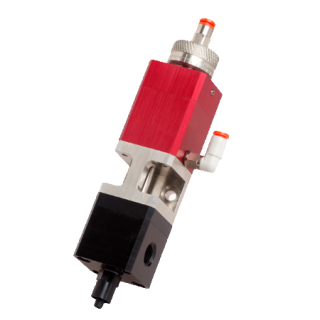 This valve can be used in handheld applications, mounted on a fixture for hands free dispensing, or mounted to a robot for automated dispensing. The all plastic construction allows adhesives such as Cyanoacrylates and Anaerobic to be dispensed through the valve along with a variety of other low to high viscosity fluids. 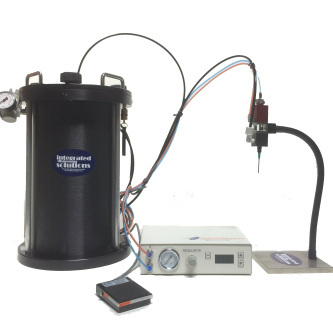 Applications can include dispensing dots, beads, or for potting. 1) Air section (Aluminum top portion). 2) Fluid section (Delrin® body with Teflon® diaphragm). The air section is aluminum with a simple piston/cylinder combination used to open and close the valve. A stroke adjustment bolt in the upper air body controls how far the piston and needle assembly can retract thus regulating the rate of fluid flow. The fluid section is made of Delrin®with a rigid Teflon® diaphragm connected to the air piston. Fluid dispenses as the point of the diaphragm is lifted out of the fluid section orifice then stops as it moves back into place. The stroke adjustment bolt of the air cylinder regulates the distance that the diaphragm tip can lift out of the fluid section orifice. This action is the primary controlling rate of fluid flow. Accuracy with the valve depends on a steady air supply and the material properties. +/- 5% or less of a variance of the shot size volume can occur. Stroke Adjuster control over flow rate. Teflon® and Delrin® are registered trademarks of Dupont.